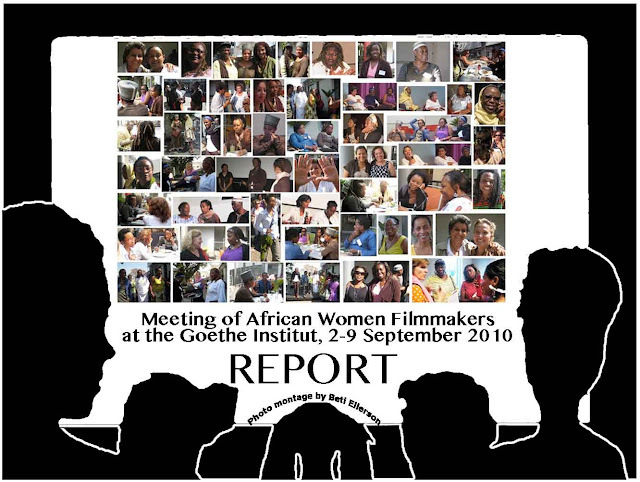 The African Women Filmmakers Forum, organized and sponsored by the Goethe Institut, was held from 1-4 September 2010 in Johannesburg, South Africa. The Women of the Sun Film Festival organized alongside the forum ran from 2-9 September. Most of the women who attended the forum also screened works at the festival. Twenty-five women from more than fifteen countries, representing most regions of the continent and the diaspora, convened to discuss as a group the various issues that they had vowed to keep alive since their last gathering. Diverse approaches were employed throughout the meeting to ensure an environment of empowerment, trust, mutual exchange and sharing. A variety of strategies were used to get to know each other, to talk about relevant experiences, interests and ideas. The sister circle, a common arrangement within women’s groups, was the designated format for the larger group discussions. Informal meetings took place during lunch and tea breaks in the courtyard. Key women of the Goethe Institut and German cinema and studies provided a welcoming and structured space to share and network. Among these women were scholar Christina von Braun, one of the keynote speakers, and filmmaker Dorothee Wenner who moderated the various activities. The purpose of the meeting, according to the organizers, was to contribute to existing structures and build upon long-term strategies, thus working alongside African women filmmakers who are already leading the way. The keynote speakers explored gendered perspectives on film studies in general, African film history, and the role of African women filmmakers. Christina von Braun’s talk, entitled “Film and Gender”, focused on representations of women from the beginning of the moving image, Beti Ellerson presented an overview of the evolution of African women in cinema, and Peace Anyiam-Osigwe discussed current trends, the future of African cinema and the role of African women filmmakers. The various components of the forum provided a space for reflection, troubleshooting, discussion and workshopping. Thus participants from different regions shared experiences and received feedback and suggestions. At the same time as accomplishments were highlighted, less successful stories demanded problem-solving with an emphasis on how to turn the next project into triumph. While the working language was English, the translation into French and Portuguese was informal, spontaneous and amicable. Throughout the forum the participants assessed the current situation in their respective countries and the continent as a whole and offered recommendations to the various proposals presented in the larger group and during the breakout sessions. On the final day, The Open Forum “To screen and be seen: Female perspectives on African filmmaking”, moderated by Dorothee Wenner, brought together the forum participants and the larger cinema community of Johannesburg within a space of dialogue and exchange. June Givanni summarized the forum events, providing highlights, after which filmmakers Rumbi Katedzi, Jyoti Mistry, Fanta Nacro and Monique Mbeka shared their experiences, while Katarina Hédren gave French-English translations. We need you to make films about Africa to counterbalance the images that we don’t see. Do not allow what we are perceived to be, to become what we are. Women write stories that perpetuate stereotypes, such as the wicked mother-in-law. Often times they are women scriptwriters. African women are traditional storytellers, why are we not creating the stories that need to be told? African cinema is about economics, what people can afford. Television has lead to New Media. When we speak about television we speak about New Media. The future of Africa depends on what we will do for the women of our generation. What we are trying to do is to build structures and institutionalize. Training cannot be done outside of the context of distribution. It is a luxury to make films that we like/want. We must address what the audience wants. We are alone, working in isolation. There is tremendous pressure working in this business. Women cannot underestimate the power of coming together. We must create an interest in order to promote young women. African women filmmakers must have their space whether it be virtual or real. Alot of the films by African women are not very feminist. Let’s work together rather than in isolation. Young people tell stories about hope. We want to see films about it. Creating a culture where we love and venerate our film. Safi Faye has been a role model, an inspiration for me, giving me the desire to make films, to fight for the right to do so. The group of women here represents and reinforces what I see happening throughout the continent.